Each red square stands for a country (represented by a 2-letter country code). 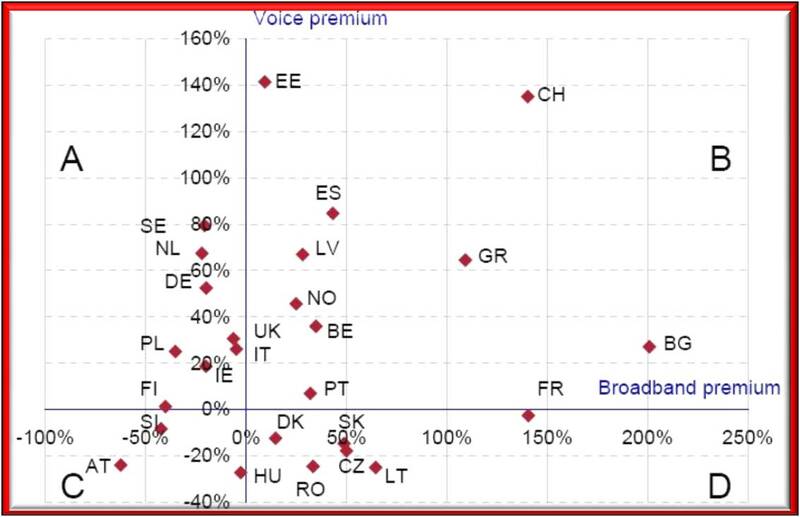 Mobile broadband pricing in countries on the left hand side of the X-axis is less than that of fixed broadband (implying a negative premium). For example, mobile broadband pricing in Austria (AT) is ~60% less than that of fixed offerings. No wonder, mobile broadband subscriber base is close to overtaking that of DSL out there! Similarly, mobile broadband pricing is extremely competitive (up to 50% less) in Finland (FI), Slovenia (SI) and Poland (PL). Finally, Sweden (SE), Netherlands (NE), Germany (DE), Ireland (IE), United Kingdom (UK), Italy (IT) and Hungary (HU) round out the countries where fixed broadband is more expensive than mobile broadband. There is a good mix of countries from Western as well as Eastern Europe in this list. The implication is clear – mobile operators in these countries are clearly attempting to grab market share from fixed operators by driving down retail prices – in many cases, below cost. Clearly, mobile operators need to reduce the cost per transported bit to protect their margins – otherwise, the business becomes nonviable. Finally, no points for guessing where growth in mobile broadband could be tepid. Pricing premium is as high as 150% in both France (FR) and Switzerland (CH). We can safely assume that the mobile broadband subscriber base in both those countries will not grow like gangbusters! Given that the dominant operators in these countries (Swisscom and France Telecom) control both fixed as well as mobile operations, there is clearly no incentive to aggressively go after the fixed subscriber base. The situation is similar in United States as well as Canada where mobile broadband can put you back as much as $100 per month for a 6 GB data card plan. Pingback: Heart of the Matter - Bytemobile Blog » Blog Archive » Can Fixed Line Operators Survive?